They are just lovely as usual, I always fall in love with your fabrics! 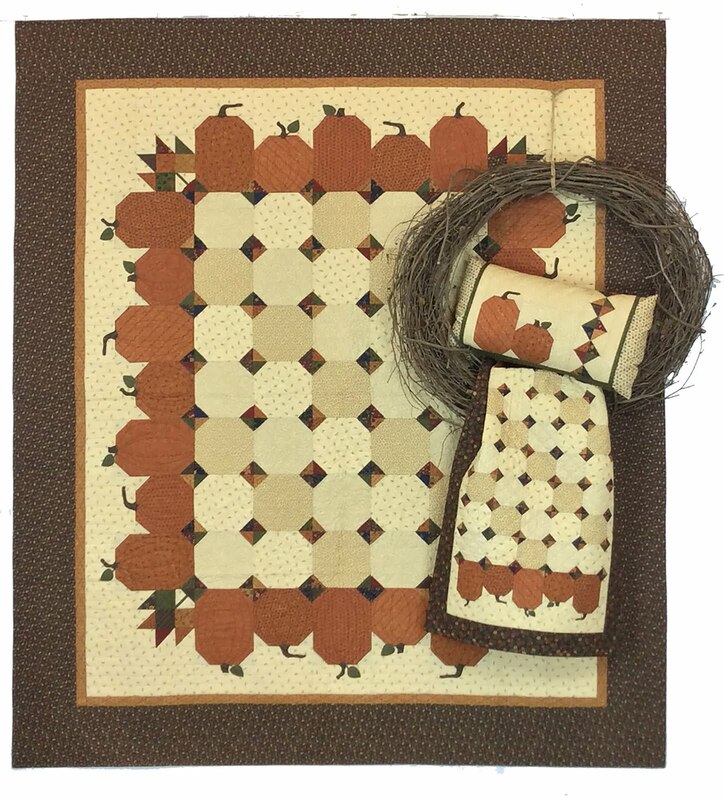 I love the fabric and warm colors they are super! Always love your colors and patterns. Wow, I am going to have to look for this fabric. I need it to replenish my KT stash. Thanks for your continual inspiration. Your fabrics are always beautiful, can't wait to see it in the stores!!! 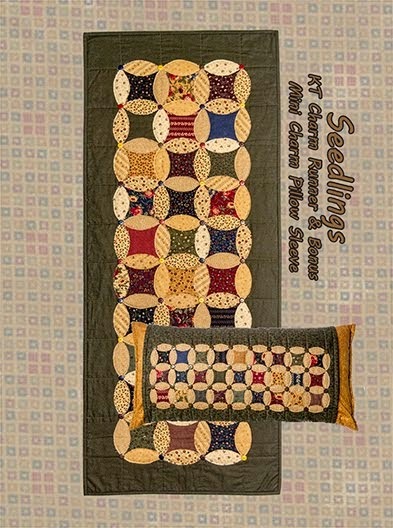 Recently found a quilt store in PA about an hour away that had your fabrics right up front. Many of the stores near me are more modern so now another reason to drive north. I’m going to sign up for your collector’s club so I’m guaranteed some yardage. Thanks for the chance to win a little bit. Jan, I'll be in the PA/NY area next summer. Would love to meet you. I'll post more info about my travel schedule as it gets closer. Love your new collection! 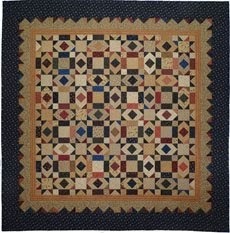 KTQ is one of my favorites ... love the colors! Thank you! Very pretty! I certainly am ready for some flowers here in the Northeast! Oh, another lovely KT collection that I will have to get my hands on! So pretty, Lynne. I think my dream job just might be unpacking new KT fabric! I live 1200 miles north of you tho!! Have a blessed Easter holiday and thanks for this chance. Sunshine would be welcome here! We have had cloudy rainy days here for the past week and have a chance of rain all the way through Sunday. UGH! 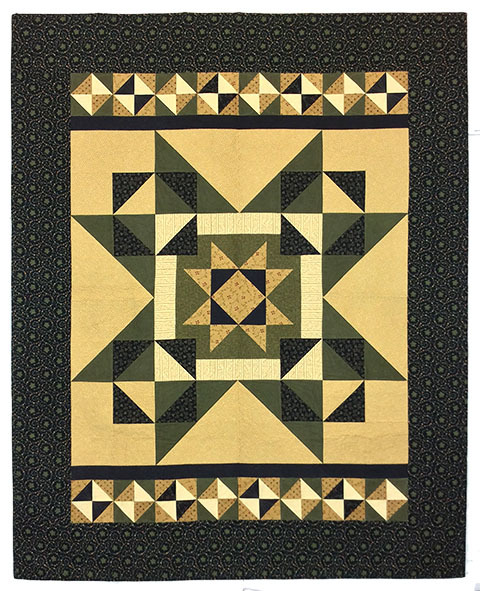 I love the BOM quilt. It is gorgeous! You are so prolific, how do you accomplish it all. 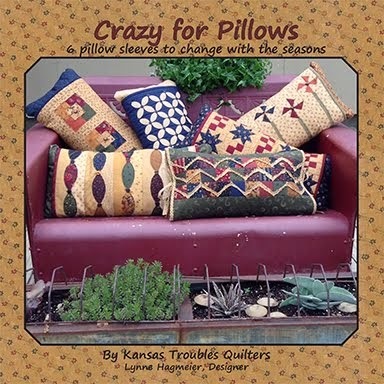 Kansas Troubles fabrics are always my favorites (I’m a hoarder), I’ve been collecting for a while. Congratulations on the new line! 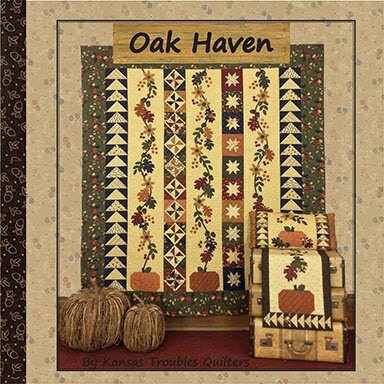 Thanks, I have lots of help including 3 piecers and 2 quilters along with my husband who runs the store. Wish I had more time to sew! 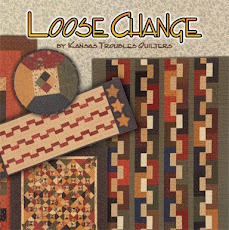 I love the new fabrics and patterns!! I always gravitate towards your fabrics at my LQS!! 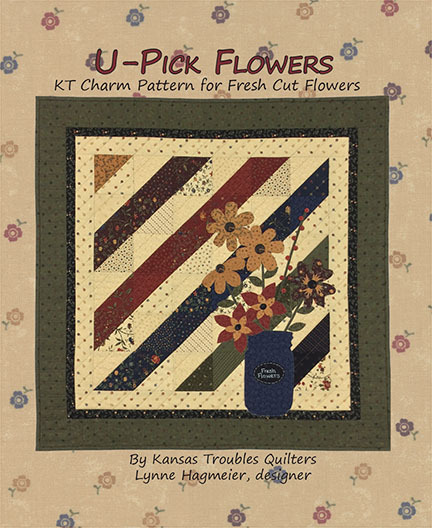 Love the idea of a KT collectors club and the new Fresh cut flowers! 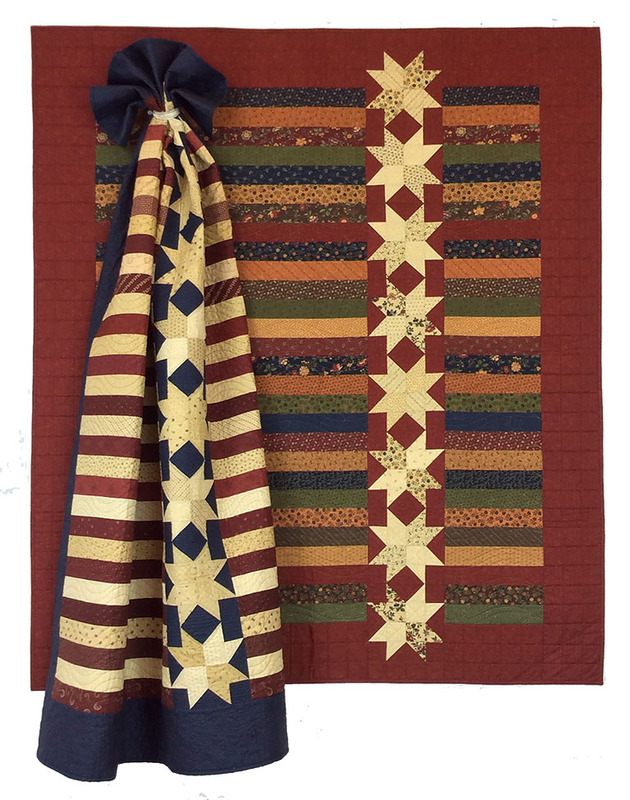 I wish I lived near enough to your shop to visit and see these fabrics in person. 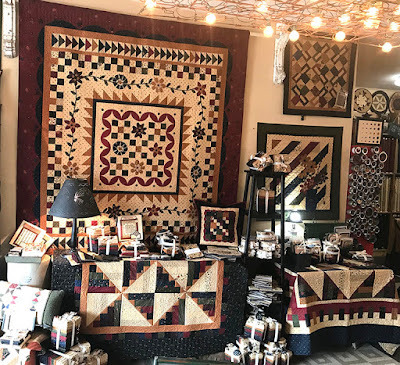 They look beautiful, as do the quilts hanging in the photos. 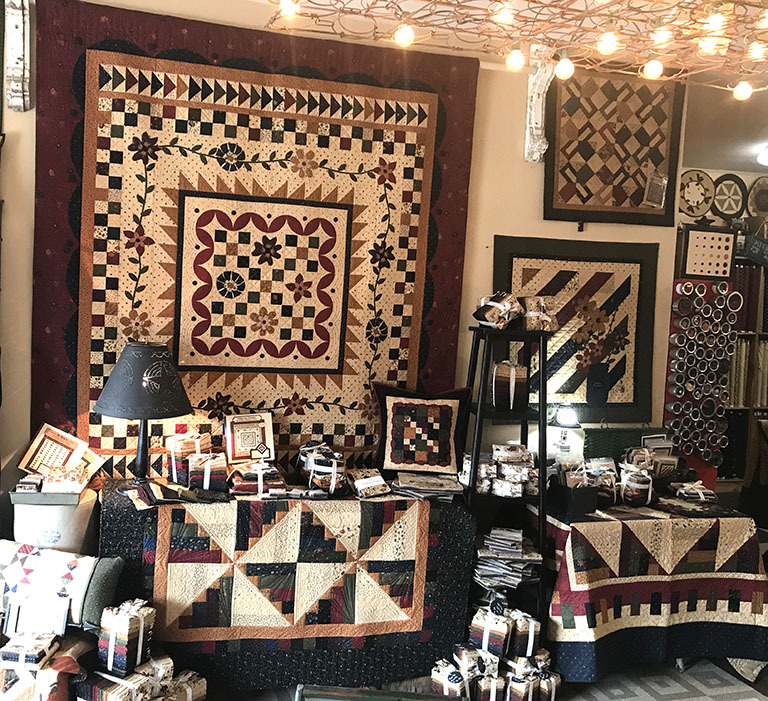 It must be wonderful to own a quilt shop! Love the collection! Hurry up middle of April! I’m anxious to get started on the new BOM. Brenda, Thanks for joining in! Joy is cutting as fast as she can! I always love your collections with the purple fabrics. Can't wait to stitch up something with Fresh Cut Flowers! Always love your fabrics and patterns. Would love to win this. patterns that show them off so well! I would love to have some fresh cut flowers. Count me in. I just finished a top using Bees and Blooms. Fresh cut Flowers looks to be just as gorgeous. Would love to get started on this new line. I have been waiting for this collection to come out. Beautiful! 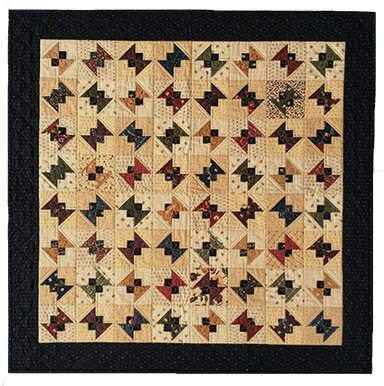 The U Pick Charm quilt is lovely. It would love to have it hanging on my wall. Love, love, love the U-Pick Flowers. 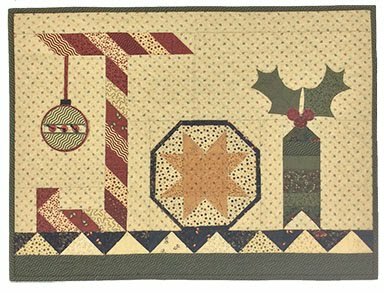 Perfect new addition to your already wonderful fabric collection. Lovely new fabrics! And don’t we need some spring right now!! 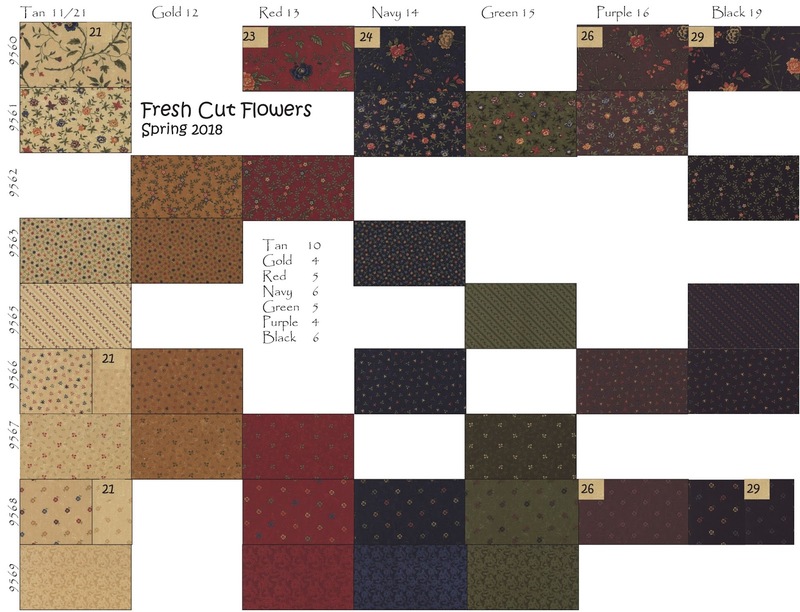 I’d love to make some flowers with your fabric to help spring arrive! Happy Easter! Another beautiful collection to get the creative juices flowing! I am ready to begin! I didn't know was a Collector's Club. Awesome! Love your fabrics ... the patterns & colors are gorgeous. Fresh Cut Flowers is no exception!!!! We started our KT Collector's Club several years ago to introduce the new fabric lines to our fans. 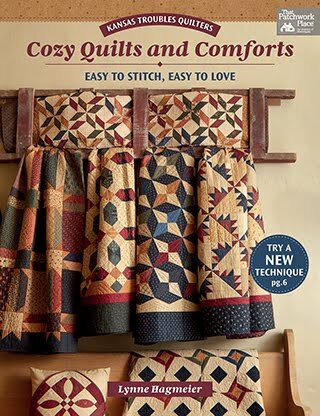 Then, you're armed with all the info you need to shop your local quilt store! I would love fresh cut flowers to welcome Spring. Thanks for the opportunity to win. Such sweet prints in that signature palette. 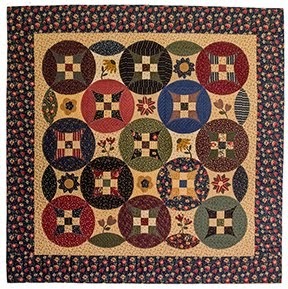 I have just the spot for the Fresh Cut flowers lap quilt on my wall! Another GREAT line! Your fabrics have been my favorite for many years. 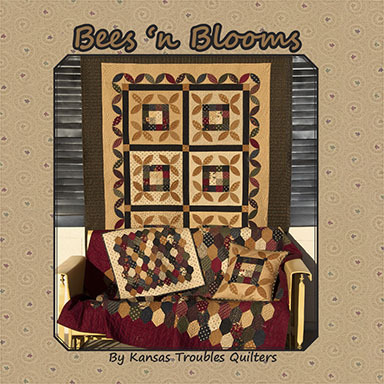 I have a friend who is moving and my bee is making you a KT quilt. She will love it! Your new fabric lines is sew pretty. 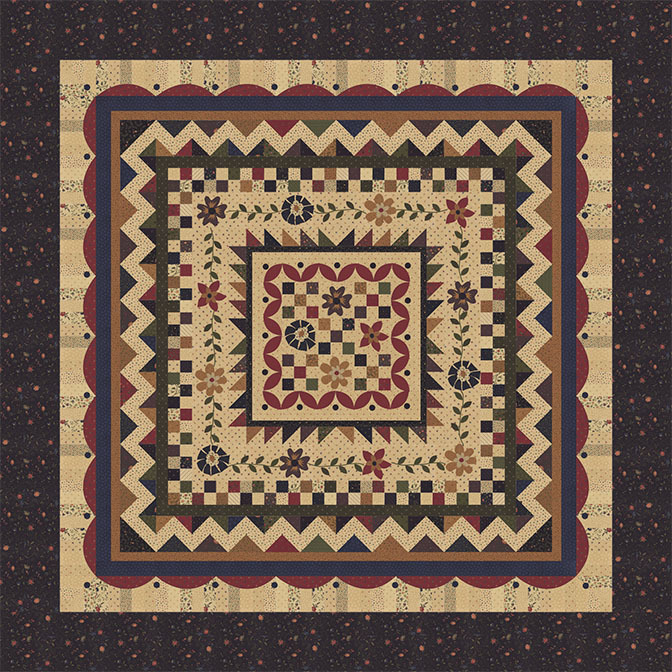 I love all your fabrics and your patterns are some of my favorites. Thanks for the generous giveaway. I could use some sunshine in a box! Your new fabrics are wonderful. Thanks for the chance to win some. How sweet, I love the new line! I love the new fabric lines. Not only do I love your color choices, but my hubby does too. That makes it so nice to have something that we both really like. The names of your lines are charming...love them...and I enjoy your patterns even though I cannot buy them all. Stars are my favorite. 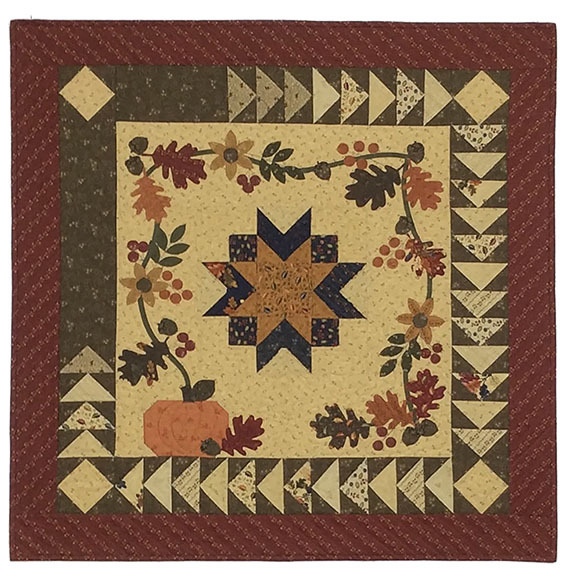 The pieced background with applique in front always catches my eye...you have several and I love them all. It would be great fun to win. Always enjoy your fabrics. Looking forward to seeing this line in person. The KT Collectors Club program sounds wonderful, I am going to join. I love love love you fabric and patterns. Fresh Cut Flowers, how fun!!! 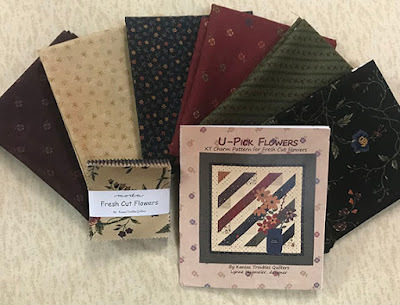 Truly your floral fabrics are my favorite. I love the wall hanging with the mason jar full of flowers! Would love to try some. Oh, I love Fresh Cut Flowers! 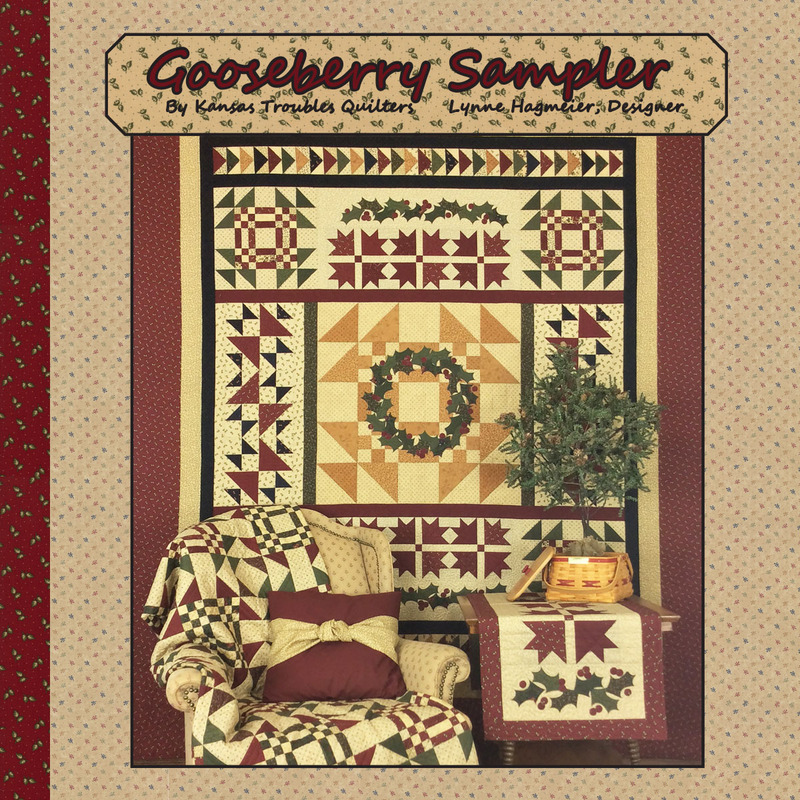 I saw some of it a my lqs the other day and am trying to decide what I want to make next. Would love to win the bundle. These fabrics are fantastic. And, is is always great to have beautiful fresh cut flowers in your house, whether they be fresh or fabric. This line of fabrics and the pattern are just great. You always amaze me. Thank you! Love the subtle flowers in the "large print" fabric. 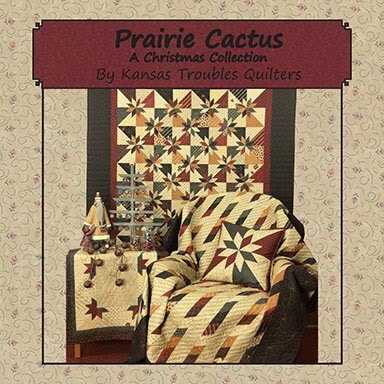 Another fantastic collection from KTQ ! 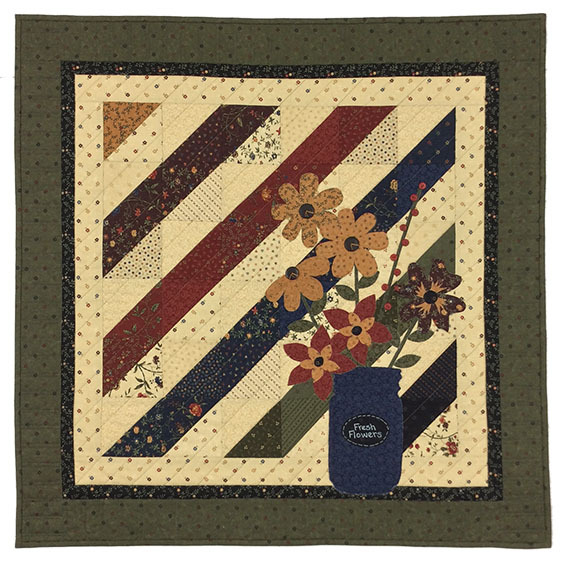 The new fabrics look so pretty--Fresh Cut Flowers--the antidote to a MN endless winter!! Delightful. Really love it all. 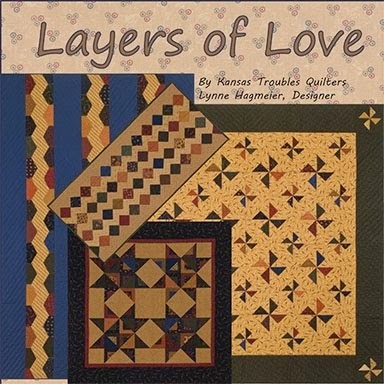 Thanks for the chance and appreciate your love of quilting inspriations. Happy Easter weekend! 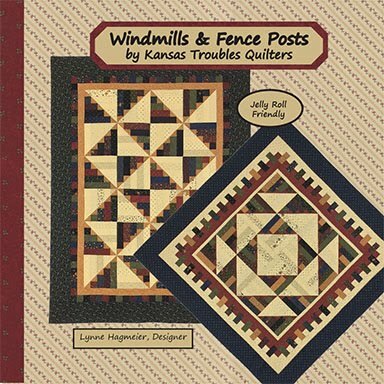 Kansas Troubles is always a favorite of mine. Thanks for the great giveaway! Fresh Cut Flowers-what a wonderful way to bring in Spring. Another great line! 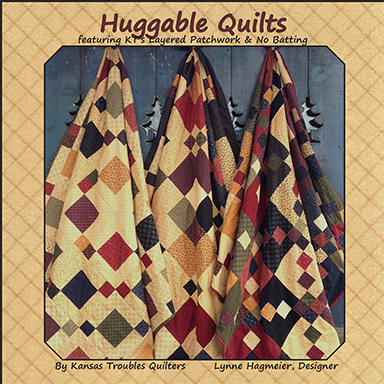 These fabrics are lovely and quite a departure from what we find in most quilt shops in Southern California ! Carol, I'll be bringing some KTQ to San Diego in September. I'm teaching workships at a retreat along with Jenny Doan of Missouri Star. I've posted info on my blog, but email me if you're interested. The Fresh Cut Flowers fabrics are awesome - as usual! Thanks! Another gorgeous collection! So pretty! It's been a long winter and I think everyone could use some sunshine and spring flowers right about now. This may be my favorite collection of yours so far. 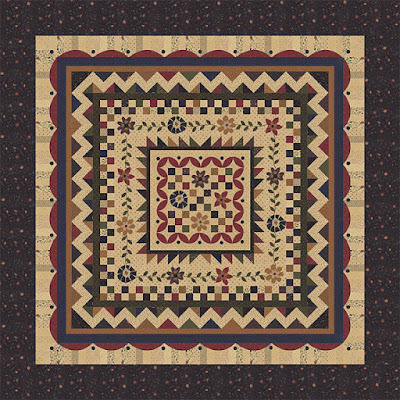 I have collected your fabrics for years and I love how well they all go together. What a great giveaway. It will help those of us who remain unsure if they want to commit to a fun club. Thanks a bunch! Beautiful! So warm and inviting! I love your fabric, there hasn't been a collection that I didn't like. Love this new Spring Collection!! Beautiful new collection, and what a neat idea the Collectors club is. 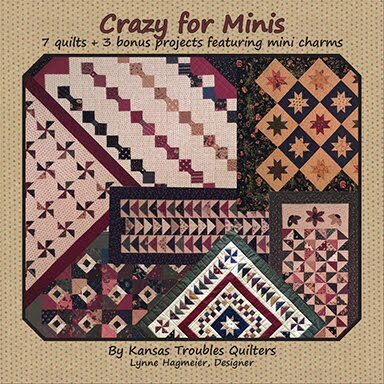 I was just using a mixed group of your mini charms for a postage stamp type quilt. I love how they are all so rich yet compliment the brighter colors I have been using too. Love this new collection. Thanks. 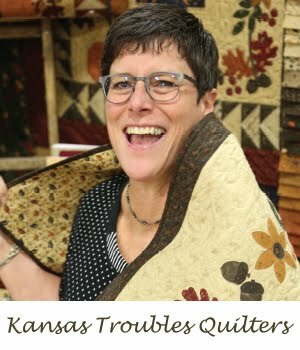 I have many KT fabrics and love them all. 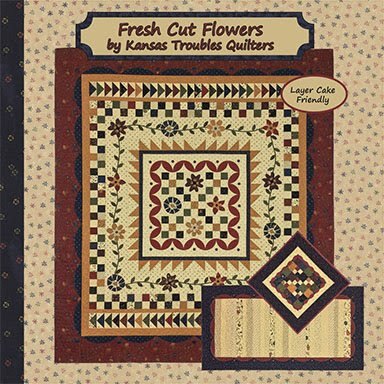 The Fresh Cut Flowers lap quilt on the wall is just beautiful! Your newest collection looks wonderful. Thanks for the chance to win. I am always happy to welcome spring! Congratulations on another wonderful collection. Oh so ready for spring. Fresh Cut Flowers is the perfect way to do it. Love this collection. Great collection, but all of your collections are great. Thanks for the opportunity to win. 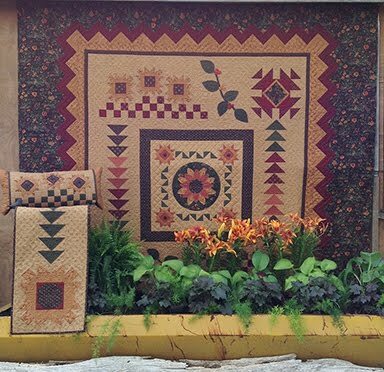 Lovely pattern and beautiful fabrics! What a wonderful Spring collection. Have a great day! I love the Spring Flowers. We are so ready! Happy Easter. I love the U-Pick Flowers quilt. That would really brighten up my boring cubicle wall at work. Your newest collection is beautiful and I am ready for Spring weather. There is a cold rain outside my window today! Your warm Kansas colors would warm me up! Can't wait to see and feel your new fabric! Your lines are always an inspiration to me! I love when new KT fabrics come out! So beautiful! Your fabric is awesome! Your patterns are awesome too! Would love to be a winner in this contest! Fresh Cut Flowers to begin Spring this year! Love them & thanks for the opportunity to win them! Thank you so much. I have emailed you. Saw you at Ohio One Stop Shop and was mesmerized. Love your fabrics and patterns. Lynne, I am so excited to be a winner Whiteeagle. Is there anything I need to do?